Here is the current track plan extended 4" on the left and 3" on the right - this is as easy as two 2 x 4 screwed on to the end on the table frame. Drill holes through extension piece, then, attach the first and then, the second to the frame end board. Once I get this setup more finalized I plan on adding another 4x8 table to make a "L" shape or possibly two smaller tables to make a "U" shape. I will be adding the 30 inch bridge back in so I will need to replace the one 30 inch track piece with three 10 inch to make the trestles work properly, but then the bridge will not be centered so may have to buy two more 5" track pieces. I will be adding the lowest elevation trestles beginning at the outer ends of the O72 switches, so where the red begins and then working towards the center back of the outer loop. I added a 4.25" piece to the outer middle of each end of the inner loop and switched the two turnouts to make the reversing loop a little bit longer. I need to make something to mount the switch controllers and the DCS Explorer unit to. I have some black flat head 1 1/2 screws to mount the track but not sure about doing that yet. I have the green carpet on top of a 2" 4x8 foam board that I plan on gluing to the 5/8" plywoood. I picked up some woodland scenic tree 4 packs from AC Moore on Saturday they were 60% off so $6 each and some fabric to make a curtain around the table. I was looking for a backdrop but all they had was clouds and I am thinking green hills if you know of anyone that sells them. Also I like the look of the rows of building fronts but have not seen them in person. 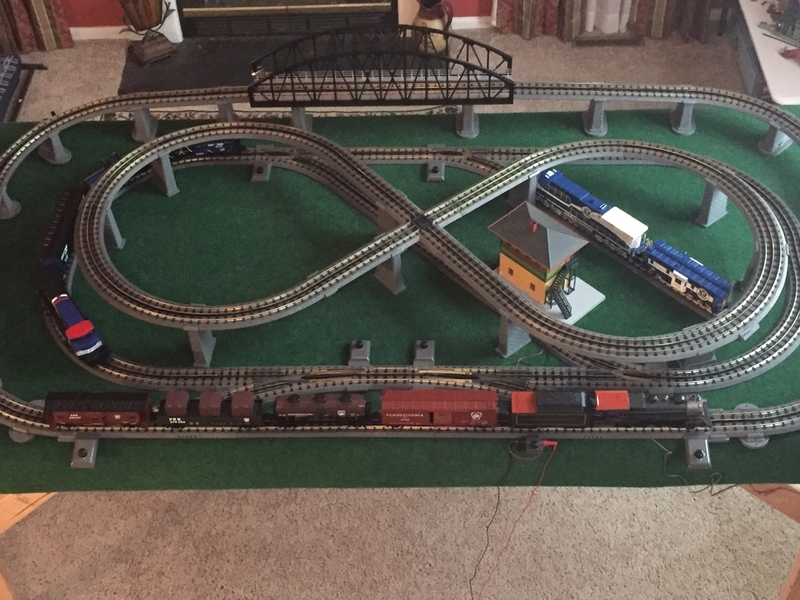 I was able to run two trains in opposite directions on both loops for 20-30 minutes last night with no issues. The O72 switches work excellently and the trains function smoothly thru them. I will try the black electrical tape and the other troubleshooting steps on the O31s this weekend. I was trying out the different DCS functions in the app. I don't like that you can not control both trains simultaneously as I almost had a crash. As a backdrop alternative, you might want to check out Staples. If you download a scenic picture from the internet (like Google Earth), they can blow it up and print to various backdrop sizes. Looked into this online and for a 4 foot poster the base price is around $100 and I would need two. Hopefully I can find a less expensive option. You're right - it's not inexpensive, but probably substantially less than an 8' long backdrop from one of the mainstream suppliers. I know you're looking for mountains, but I used the "sky" cloud paper from Hobby Lobby - about $10 - and called it a day. What the heck are $200 backdrops made of? That's insane! It shouldn't cost much more than a poster at Wally's World or wall crown strips of wallpaper. I think but hope not that this is just an operator = me error. I have been working on the switches all morning but still not resolved. My volt meter arrived and I have 15 volts around the entire layout. 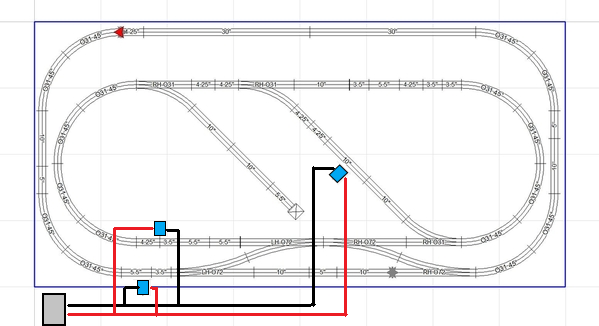 To try and simplify things I modified the layout and to just focus on the inner loop with the O31 switches. It is not an issue with an individual switch as if I swap the “good” switch out I can replicate the same issue. So if it is my misunderstanding on how these switches work then the switch would have to be in the proper position prior to the locomotive entering. But when the power cuts out all I have to do is refresh the app and the locomotive can continue on so I do not think that is the issue as that is not how the O72 switches operate. I did find this in the instruction manual (see pics) so even though I am not trying to control 2 switches with 1 controller thought this may work but didn’t want to bend out the copper connectors unless sure. I am going to do some yard work or I will need a drink but appreciate any further input. Your instruction manual wiring diagram and instructions are so screwed up, I don't know how anyone can properly wire their layout following these instructions and drawings to the letter. I've got the same instructions with my switches, but I didn't pay any attention to this particular section when I put my layout together. Thank goodness for that! 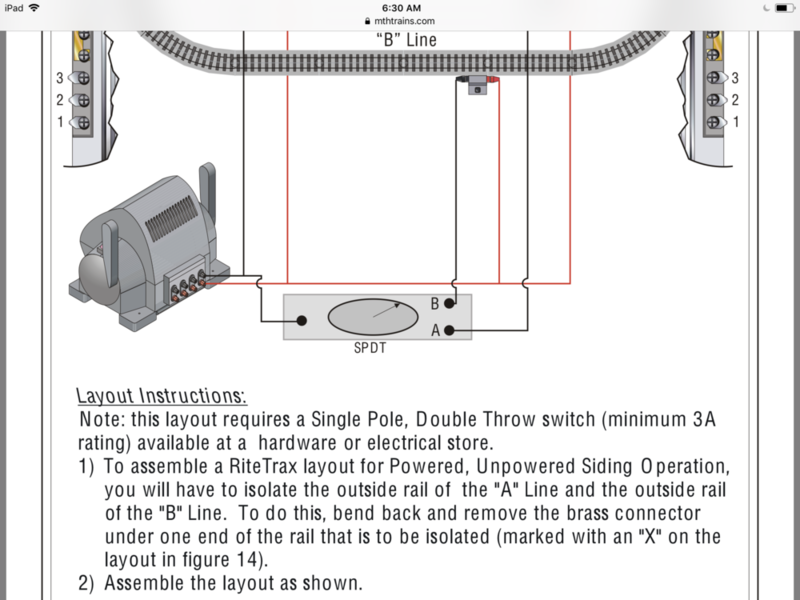 First off, if you are using an SPDT switch to route power as they show, then you need to wire it up to the center rails (which they don't show in the diagram), and not to the "outer" rails. And isolate the center rails, of course. If you have at least one reversing section (which you do have), then an outer rail can become an "inner" rail as you travel through a reversing section, and thereby cause potential electrical problems. 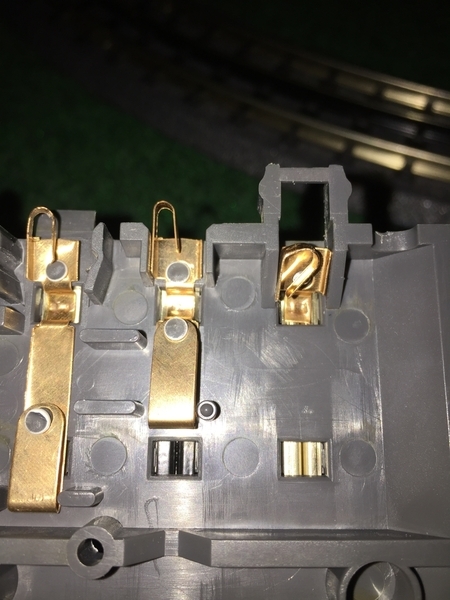 As far as isolating rail sections, don't bend out the brass copper connectors if you wish to electrically isolate a connection. Why ruin good pieces of track? Simply put a small piece of electrical tape on one (or both) of the copper connectors to prevent them from contacting each other. Make sure the rail ends don't touch either, as we have previously learned. If you are powering your switches through the track, then the momentary power draw as a switch "snaps" may be causing your problem. You may wish to try powering your switches through the accessory output of your transformer or else a separate transformer. Just some suggestions, hopefully this helps you further along. 2 Rails? 3 Rails? Doesn't matter, I can't count that high anyway. I love the smell of fresh-brewed creosote first thing in the morning. Well one more step forward tonight as seen in picture when I was going to tape off the connectors I noticed the bent one on a straight piece and replacing that did make a difference. 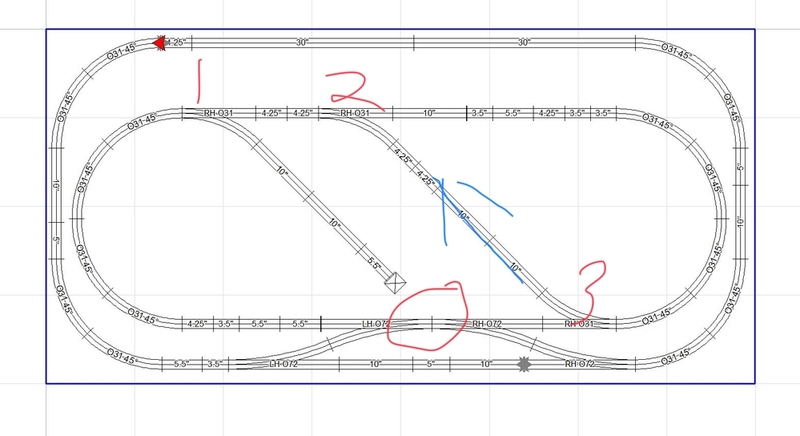 That digram works as a choice for running either A or B siding, but only for 2rail track that I can figure. ...unless there is some command aspect I'm missing and it's not focused on in the text. Move black colored wires to all red terminals & visa versa red wire to blk term, so the switch is on the center rail. Move the sidings X-isolation to siding center rails. Now only one siding is powered at a time off the toggle. Finally verify each exits anti trigger rail is also isolated. 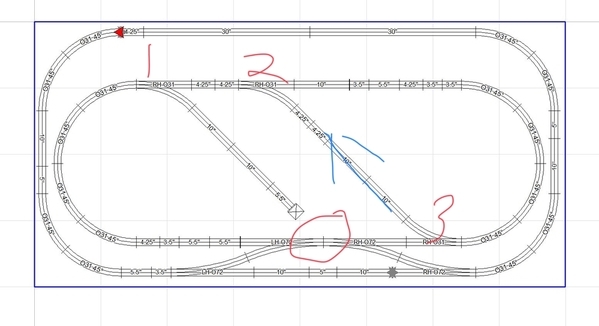 All done for loop and sidings as shown in that diagram. Any turnouts added after are treated as an addition. So, building off that; if two isolated rails of any kind, be it anti-derail, reverse loop, or crossing gate trigger, happen to by pure chance also isolate a section of the mainline hot or com., you have to feed that section its power leg by a new drop. It is your choice of how because it is essentially a new block to be addressed alone or grouped to another block. I'm beginning to guess your mixing folks instructions together, and in conjuction with experiments of your own, a little too liberally. Every change sets any one process of elimination back to square one, and the cycle begins again vs progression with at least one item now off the list. You can mix advice, but if you don't complete the advice and expand on result, plus leave us with "present state" it's hard for everyone and anyone to advise. Stick to one path so it can "come full circle". Others helping will usually try to shift that way unless they see a danger, the point of communication breakdown, etc.... but the direction seems kinda scattered here from too much change. 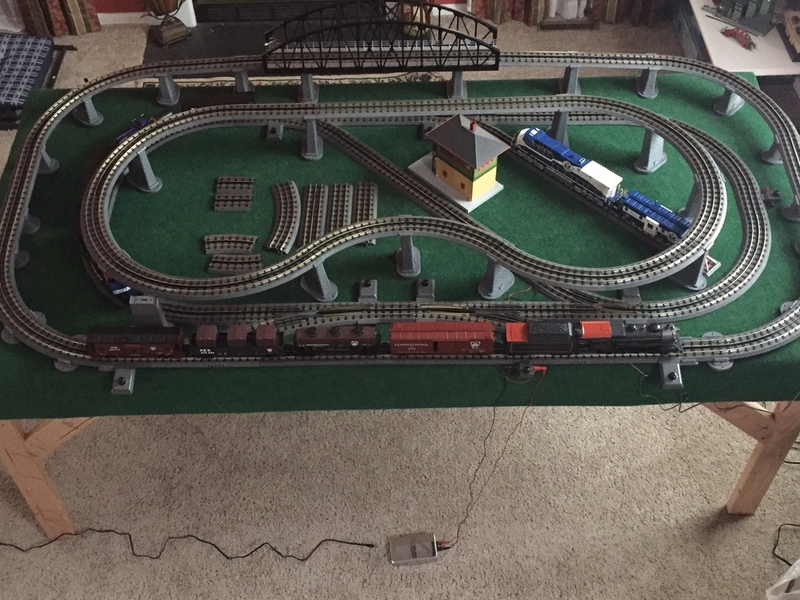 Ok, I am thinking this may be a Starter set issue - as in the transformer is only intended for use with the track (small loop) that is included with the set. I am thinking that the power supply breaker is kicking when the surge from the switch throws. I noticed this from watching the video again - switch motor light on - train running - train hits switch trigger rail - switch out of position - switch throws - switch power light goes out and train stops. The surge of current required by the switch causes an overload. Would you look at the specifications on the power adapter and post them? I didn't find them in the set instructions or the DCS Explore instructions. You now have an "advanced layout" that would require a transformer with a higher current supply. The Z-1000 transformer only plugged into the DCS Explorer (replacing the starter set power supply) will most likely solve the issue. You can bend that connector into shape with needle nose pliers. Track assembly tip - Hold the pieces of track in a V with the railheads touching and the fold the ends down. The track will smoothly connect. This gets more difficult as you build a loop - so, holding one piece in half of the V or lifting both to get a flattened V still connects better than a straight, flat push together move. Disconnecting is the reverse, lifting the far ends from a joint up. Again, this is a pain on the first joint to break a loop, so, any small angle will unlock the tabs easier. This helps prevent bending the connector tabs. It is a 50 watt power supply (see pic) with 15 volt output which is what I was getting on my voltmeter. I did look at picking up just the Z-1000 power brick used on ebay. If it is a power supply issue howcome the other switches do not cause it? So just as a quick test I have made no other changes so everything else is constant. I plugged in the extra starter set power supply and connected it to the lock on in the inner loop via the banana plugs. This lock on was and still is using the wire nut connections from the outer loop lock on that I needed to get DCS signal to the inner loop. So I now have two 50 watt power supply to the track and I did notice a difference see videos. If you look carefully in both videos when the locomotive (just using one car for testing) triggers the switch controlor it does not fully engage and power to the entire track ceases, but when using two power supplies they exact same thing happens but the “extra power” perhaps is enough to kick in and override it? But I am not sure what technically is happening here but makes me think it is not a power issue but a polarity issue. I would get the Z100 to power the track, and use the 50 watt PS, just to power your switches. Lubricating both sides of the plastic tabs on all track ends will help ease the connection process. I use a little bit of vegetable oil in a small plastic condiment cup, and a Q-tip. Soak the end of the Q-tip in the oil and then roll it around on the interior side of the cup to squeeze out the excess. Then dab it on the outsides of each tab at each end of the track sections. Then dab the other side. Do the other end of the track section, then keep going on all track sections. I want to say that it cuts the assembly force needed approximately in half when plugging the track sections together. Put on a pair of gloves, and you should be able to snap together the sections of track, even when they are laying flat on your table top. Also, visually check the copper electrical tabs right before you snap the track sections together to make sure they are all aligned for proper contact. If not, bend them into shape quick-like, then continue with your track laying. 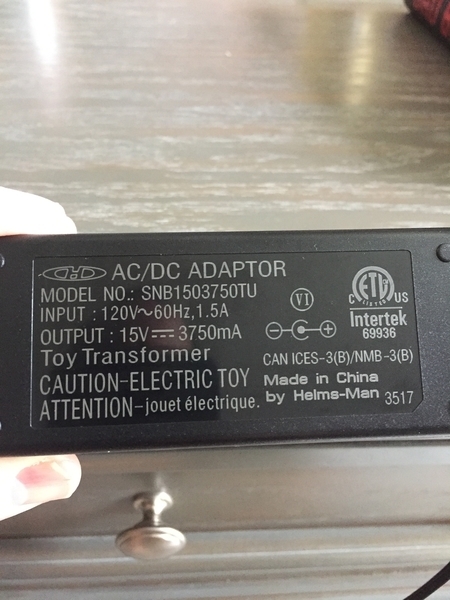 If I pickup a Z-1000 I see it has one 14V auxiliary output red/black connection. What else will I need to purchase (a switch controller hub) since I do not have an AIU in order to wire all 7 switches to the one output. I got tired of power issues (i.e., lack thereof) quite some time back. So to try and help simplify things I elimated the outer loop and all of the switches except for the two O31 switches that make up the reversing loop. I am only using one lockon now so that removes the power being routed from the outer loop to the inner loop. I was easily able to replicate the issue three times in a row so no change. I tried spacing the tracks and no change. I wired up the one switch location with the issue to auxillary power. So the switch in the video has its own dedicated 50 watt power supply nothing else is connected to it to draw power. So the power momentarily still goes out to the switch but the track power maintains. The switch does not fully engage on the first pass but does on the second. There is improvement but still no resolution. Run power from the auxiliary output to each switch individually. The use your switch controllers for each switch as normal. This is explained in the instructions that come with the switches. In order to control the two switches in tandem. Route the three wires from the switch controller to the first switch, then run wires from the first switch to the second in the same order. Red to Red, Green to Green, Black to Black. As far as track power goes.. This is 3 rail DCS. There is no need for power switches as seen earlier or reversing switches. 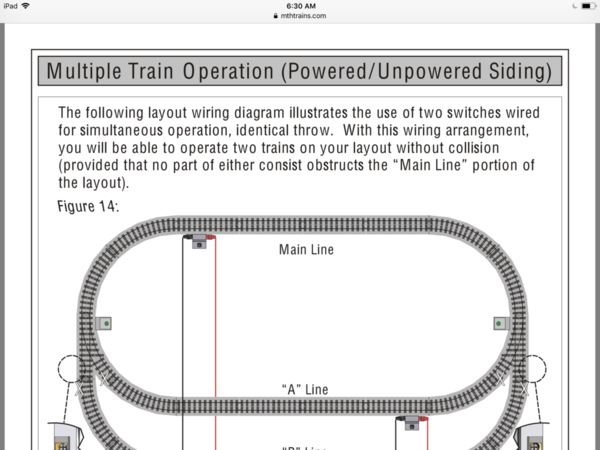 I realize that this is a earlier description of your track layout, but schematically correct. Its not that there are shorts, but just too high of a draw at times. Wire your power in this method from the DCS explorer. You fine Sir win the prize! I only have two lockons that I had setup across from each other on the outer and inner loop as you have pictured on the left of your diagram. I moved the inner loop lockon to the center of the reversing loop straightaway as you have pictured. I am only using the one 50 watt power supply plugged into the Explorer with banana plugs to the outer loop lockon and wire run from it to the center lockon connecting to the wire nuts. All switches are using track power and are working properly just in time for Game of thrones. Thanks for the videos. OK, so, it is not that lame of starter power supply. Go back to just using one power supply again. Let's eliminate the switch controller by disconnecting the wires and run the engine thru from the straight with the switch set for turn. let the non-derail switch again. Option#2 - has the motor been removed and reinstalled yet. I am considering a physical/mechanical hang up that is causing the overload. Does it move freely when turning the lantern? The pause with the two power supplies gives me cause to suspect somethin mechanical. I also found when working with 250 ft of RealTrax that had been sitting in storage for 12 years that some of the switches were finicky. Some issues were resolved just by changing adjoining track. I could determine why and had too much work to investigate. We actually had some of the magnets come unglued from the motor and either remain in the switch or just get lost. I suppose age dried out the adhesive. Glad to hear that the layout is operating properly. 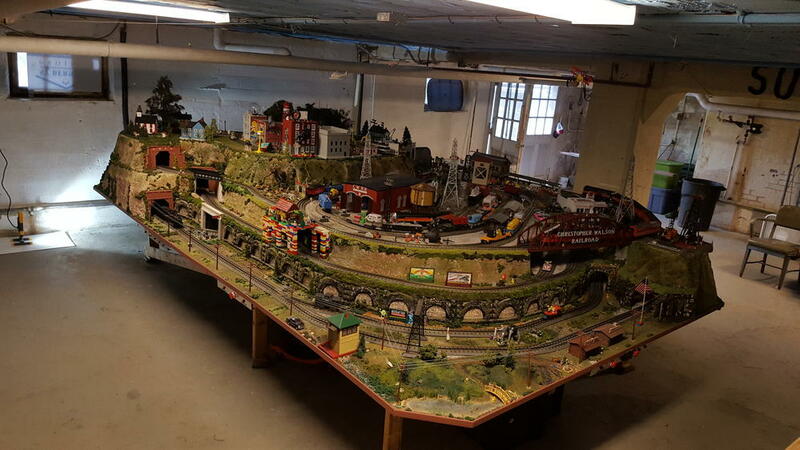 You have passed the model railroad troubleshooting power 101. Keep us updated and have fun! 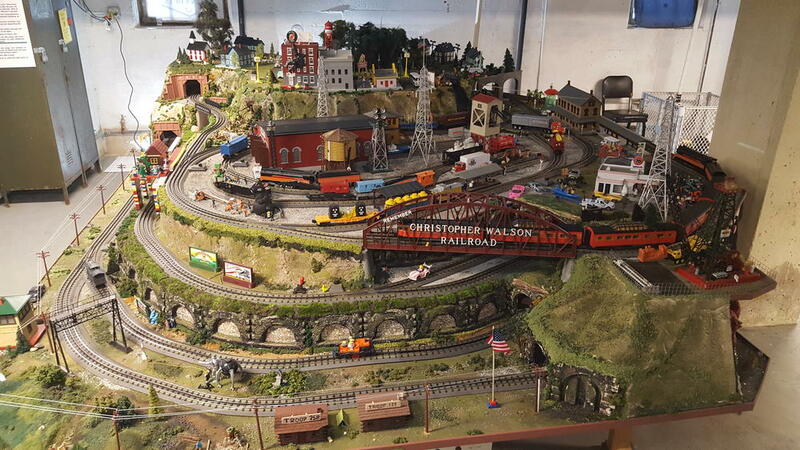 Not sure if I will be able to get to it tonight but I am looking forward to getting my layout "finalized" with the bridge and trestle set so I can see what my options are moving forward from there. I need to finish wiring the switch controllers but the two up top will not reach where I plan on adding my control board. I have rolls of 16 gauge wire in red, black (used for power) and green, but that seems a little too robust for the switches and accessories. I read in another thread about using thermostat wire so will see what they have at lowes. Not having an AIU is there anything else you can recommend for wiring all of the switches to for organization. I may still get the Z-1000 and use Aux power. Love the pics of your layout. Well, you can wait for the Aux power supply. Not a big deal to wire that up at a later time. @Greg Nagy ,also suggested to wire the crossover pairs together with one controller to save space. I second that idea. "In order to control the two switches in tandem. Route the three wires from the switch controller to the first switch, then run wires from the first switch to the second in the same order. Red to Red, Green to Green, Black to Black." The thermostat wire is the easiest that I have to found to source. I purchased a dual stapler that shoots the round and flat staples. The round staples are great for organizing the wires under the layout. The depth of the staple (staple length) is selected to prevent crushing the wire. Limiting under table time on your back will become a priority. Some use a simpler method and feed the cables through hangers leaving the wires loose. The switches need a home run cable from some controller. That can't be avoided. A good rainy day and I got to work on my layout some more. I added the bridge and trestle set back in and learned that even the lowest grade makes the outer rail on the switches make contact so had to make sure spacing was corrrect. I would like to add a third elevated loop but perhaps to busy looking, opinions are welcome. I like the look of the dog bone better then the figure 8 but need to figure out spacing and support with the MTH trestle elevation kit. Here is a video of my switches working for now. Looking at ordering a backdrop from Track Side Scenery and moving this all to what will become the Train room. Gauge enables distance with less voltage drop and adds amp delivery... your loss of power really likely boils down to mediocre power on tap. More amps/watts would have not likely not needed the drop moved. This suggests something has a weak connection still. Hopefully; like tubular track; connections improve with some run time. More drop wire is really needed also imo. 16g is fine for that size layout. The Z1k may like 14g even better. 4 trains is a bit hectic on "derailment day".....those days when flange gremlins get bold. Maybe with #4 being a trolley? A great "always on accessory" imo. 3 actual trains to control, 30-40 cars total is about right for me on a table. A trolley or two and fewer actual trains runnings during tinker time is much less intense to have to monitor. I also like the concept of a small elevated line with a small engine and crane car, hopper/ gondola, maybe a passenger coach, but not much more. It will be servicing the businesses below by loading directly from yards onto the main line cars, visa versa &/or scooping to hoppers to be moved and dumped back to ground lines or bins/yards; maybe scooting a few local folk around too. Thanks for all the information. I picked up some 16G wire and a soldering gun from Lowe’s the other day. Was also looking for a terminal block like the one MTH makes. I did not get the Z 1000 yet I am going to go to my LHS and check out their TIU/AIU setup before making the decision on which way to go with power. I am going to add another table this week probably a 4x6 that I will use as a yard and then use the 4x2 leftover as a control station. 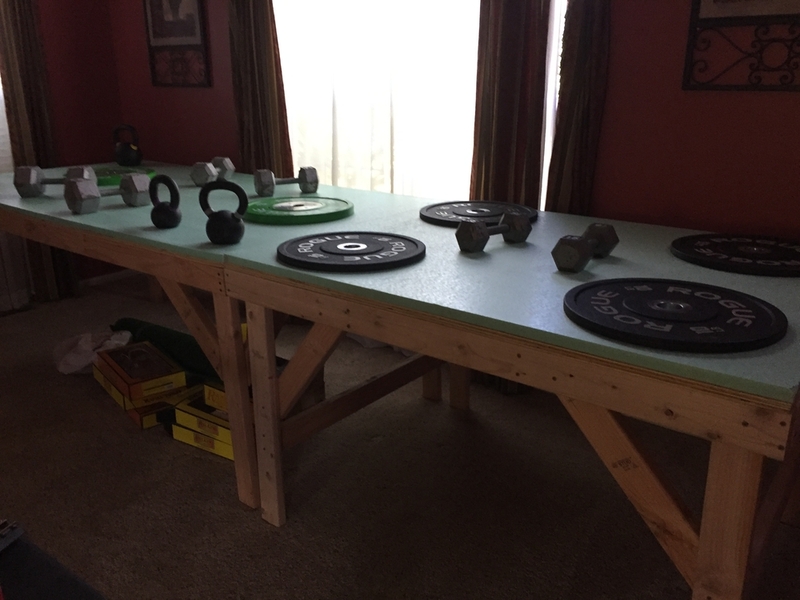 I added a 4x5 table so makes the total length 13 feet. I left 1 1/2 feet around the sides and back for easy access. I went with the 1” foam board which will work well with the black flat head paneling nails I have for the track. I ordered some woodland scenics buildings and need to pick up two more switches for the reversing loop in the other direction.